Who Will Stop America's Plague of Hideous License Plates? The designers behind the States Plates Project are here to help. While Norway puts us to shame in 2014 with their sophisticated new passports and money, the U.S. remains committed to providing its people with cluttered, boring government-issued items. It's especially bad on America's roads. As William Morgan explained in Slate earlier this year, American license plate design has long left behind its days of two-color metal slabs with the occasional local icon tossed on for good measure. Since the 1970s, the introduction of pearlescent plates—replacing embossed ones—has made it easy to slap on any sort of "design," and the profitability of customizable plates has made states all the more willing to encourage as many iterations as possible. Even some states' default plates are overrun with too many colors, useless text, and poor typographic treatments, making it impossible to avoid getting an ugly plate in the mail. Who will save us from this design crisis? Perhaps Jonathan Lawrence, an Atlanta-based graphic designer who heads the State Plates Project. With the goal of having each state's plates reimagined by a different designer, Lawrence started off by reaching out to a few of his friends before putting out more requests on social media. The project launched last October, with 39 plates published so far. Lawrence, who plans to have all 50 plate designs published on his site by the end of the year, spoke to CityLab via email about the project. It's certain to appeal to the design community, but it could bring real change if state legislators and bureaucrats catch on. What kinds of designed objects are you most interested in? For my own work, I am most interested in branding. There's nothing I love more than taking the essence of a company and boiling it down into a tiny little mark. For inspiration, I am most inspired by old stuff. I run another blog called Type Hunting that archives a lot of stuff I find and am inspired by. My search for old stuff is really what led me to notice the decline of license plate craft. Old plates had so much character and attention to detail. They combined good design and functionality, and somewhere over the last 50 years, that good design part got lost. Today's plates don't have half the character the old ones do. What period of design history are you most interested in? Probably the 1950s to the 1970s. Herb Lubalin, Paul Rand, Saul Bass. They shaped American graphic design and are still relevant today. You're originally from Florida and currently live in Georgia. 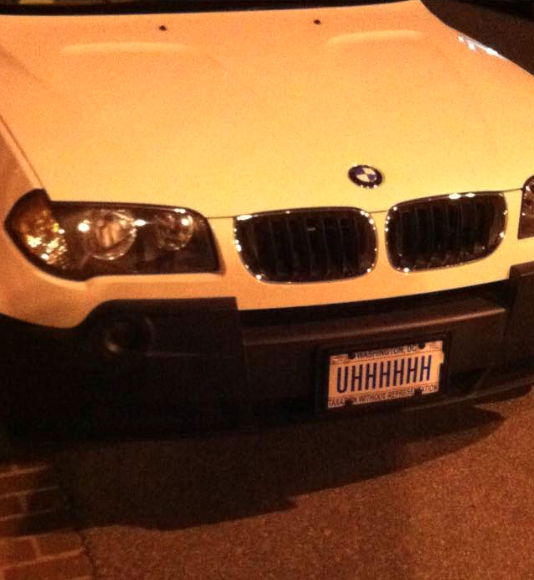 Can you tell us something interesting about both states' license plate histories? Both plates have a pretty varied history in terms of colors and graphics. The biggest consistencies over the last 10 to 15 years are probably Florida's orange and Georgia's peach. Currently, the Florida plate features a URL, MyFlorida.com, a terrible website that has no connection back to the plate whatsoever. Why would one need be bothered with URLs while driving? To learn more about Florida? The current Georgia plate features a picturesque peach farm sunset behind the tag numbers and a lack of [typographical] hierarchy. 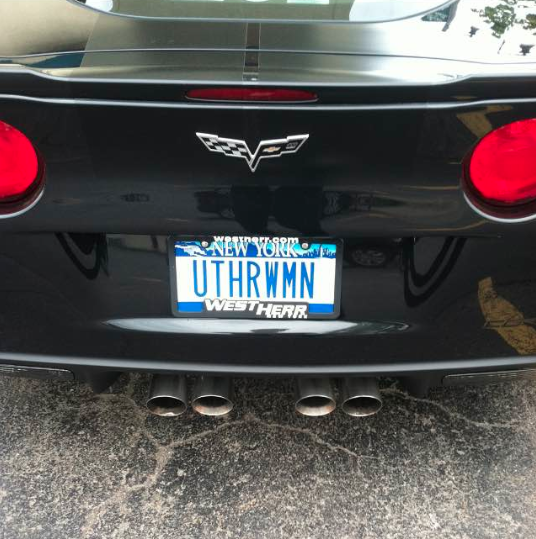 What current license plate design trends do you dislike the most? Is there a plate or a state in general that best exemplifies that trend? I believe the plate started to decline once they enabled 4-color printing. Once that happened it was kinda like "anything goes" behind your tag number. Our current Georgia plate is a great example. As is this Ohio plate. The Georgia plate mentioned above was really the inspiration. I was personally inspired to do this project when I received my own Georgia license plate. I got it in the mail, didn't even get to pick it out, and of course, it was awful. Some crazy 4-color process print of a peach farm and sunset going on in the background. I thought, "Why aren't these things actually considered? What if we really tried to design them? What if I got other designers involved? What if we really tried to do something about it?" And here we are. How do you select a designer for each state? I initially reached out to handful of friends I knew from their respective states. After that, I spread the word on Dribbble and tried to find designers with connections to each state. It was important to me that the designer was passionate about the state they were working on. Does their work have to have a certain kind of sensibility? Do you play any sort of role in the design process for each plate? I hand-picked a lot of designers whose work I respect, so for the most part, besides some initial direction, I've let them do their thing. It was important for them to capture some qualities about each state that make it unique, but at the end of the day, that shouldn't take over. The plate should still be functional. I've had to "curate" a few, but only to push things like functionality or hierarchy. This project is more of a challenge in design restraint than artistic expression. Many of these plates appear nostalgic for 1940s or 1950s America, a period people romanticize the most when it comes to U.S. car culture. Is that a coincidence? Not at all. Its good that's coming across because, like I said above, those older plates were part of my inspiration. On the other end of the spectrum, the Maryland plate appears to be rather progressive, with some innovative typographic treatments. What plates from this project have surprised you the most? Ha, yeah, I've taken some flak for the Maryland plate. It may not be as practical as others, but I appreciated the creative approach. If you know anyone from Maryland, you know they are passionate about that flag. I loved the depth of which David Sizemore thought through his New Jersey plate, or Drew Roper's registration stickers for Missouri. Those two guys really went above and beyond what I was looking for. Of all the plates from your project so far, is there one you're most fond of that best exemplifies what you want to accomplish? I love Zach Graham's Arkansas plate and Anthony Lane's South Dakota plate. I think they're a perfect example of form and function coming together to make something better. There's absolutely no way those state's current plates are better. South Dakota, by Anthony Lane. What's your favorite state-issued license plate currently in use? 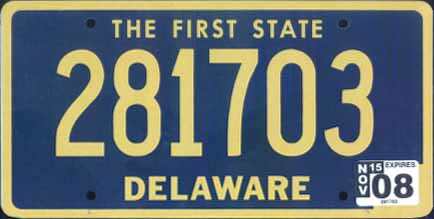 I love the simplicity of Delaware's current plate. Colorado is also pretty good. A favorite one no longer in use? 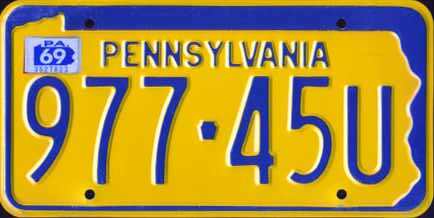 The Pennsylvania plates from the '60s were perfect. The state is conveniently a similar size as the plate and makes for a nice little detail. Simple, but unique, no need to ever change that. Have you or any of the designers gotten feedback from government officials who'd have influence over how a state handles its license plates? Not at the moment, but it's next on our to-do list. That's the whole point of this project, we want to impact and change the way America thinks about license plates. 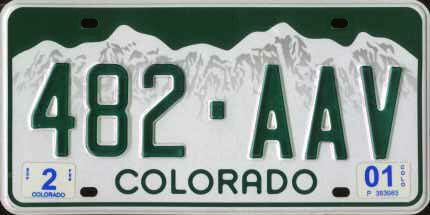 Check out all of the license plate designs over at StatePlateProjects.com.